DECRA Tile is pressure formed aluminum-zinc alloy coated steel with an acrylic bonded stone chip finish. The stone coating resists fading and UV penetration. Combines the superior performance of steel with the classic beauty, elegance and architectural detail of an old world Italian tile. 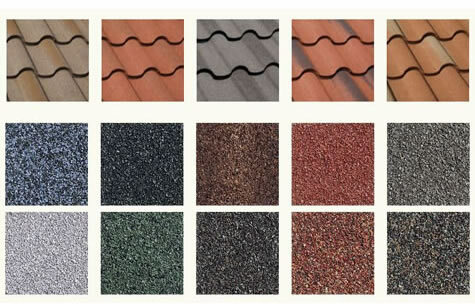 Durable and lightweight, Villa Tile requires little to no maintenance and is walkable. DECRA Villa Tile is pressure formed aluminum-zinc alloy coated steel with an acrylic bonded stone chip finish. The stone coating resists fading and UV penetration. Disclaimer: Colors may vary with each computer monitor. To see the true colors, please stop in and see our samples.